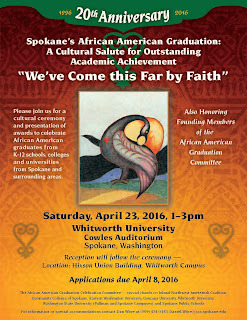 Whitworth University will host the 20th Annual African American Spokane Community Graduation Celebration at 1 p.m., Saturday, April 23, in Cowles Auditorium at Whitworth University. 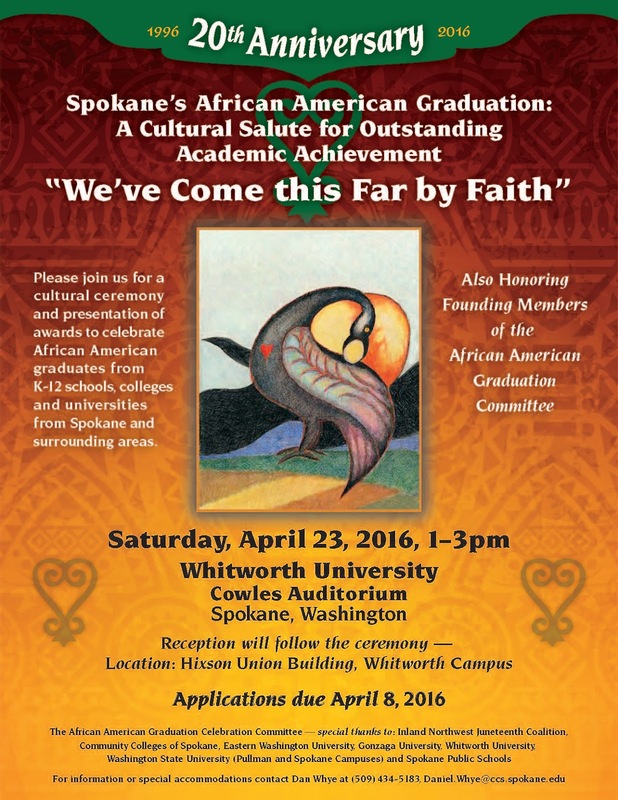 This celebration recognizes the academic achievement of African American students graduating by August 2016 from K-12 schools, colleges, and universities in Spokane and surrounding areas. The 20th-anniversary celebration is a significant milestone for the Spokane community, and, during the ceremony, the founding members of the African American Graduation Celebration Committee will be honored. To participate in the 20th Annual African American Graduation, a student’s registration must be completed and received by April 8. Students can also RSVP online at http://bit.ly/1QFiuCZ. Shawn Washington, director of student diversity, equity, and inclusion, Whitworth University, (509) 777-4330 or swashington@whitworth.edu. Daniel Whye, African American Graduation Committee chair, Spokane Falls Community College, (509) 434‐5183 or daniel.whye@ccs.spokane.edu.